Cooking Quinoa: Wash Quinoa Add butter in a pan and fry Quinoa for a few minutes add hot water and cook till Quinoa is done. To the cooked Quinoa, add Broccoli florets and about 10 chopped cherry tomatoes. Cooking Chicken: In another pan add butter, chilli flakes, rosemary (or thyme). Add the chicken and season it with salt and pepper. Cook on high flame so that the juices get sealed, the cover and cook till done. Remove the chicken and keep aside when done. Making Sauce: In the pan you cooked chicken, add about a tablespoon of butter and as it starts to bubble, add Garlic, onions and fry till onions become translucent. Add 1 cup milk, bring it to boil and stir in cornflour dissolved in cold water or cold milk) After the sauce thickens, Add 1 tablespoon Parmesan and all the cheddar cheese. Add salt to taste switch off the stove. Stir in yoghurt after switching off the stove. 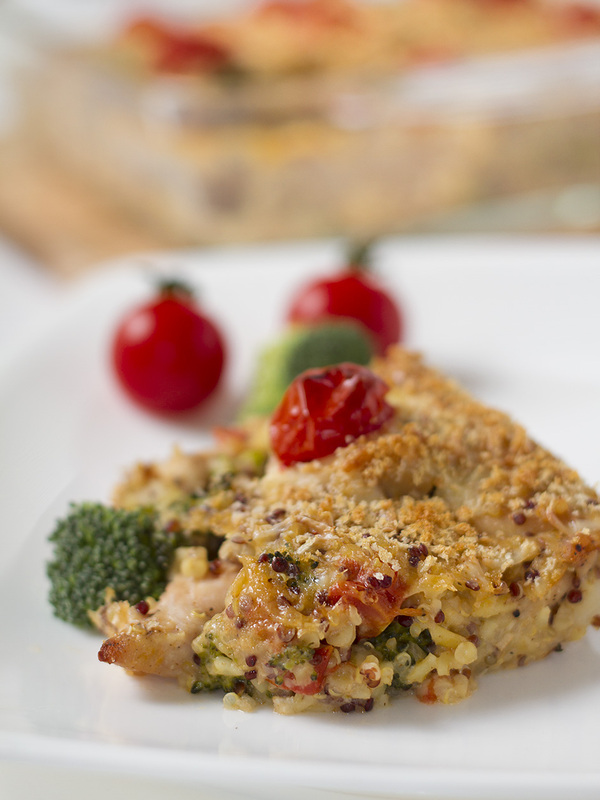 Baking: Mix the Quinoa, Chicken and Sauce in a baking dish, sprinkle the remaining cheese breadcrumbs and 4-5 cherry tomatoes and bake till the cheese melts and browns. Serve hot. Quinoa a species of goosefoot (Chenopodium), is a grain crop grown primarily for its edible seeds. It is high in protein, lacks gluten, and is tolerant of dry soil. Quinoa (the name is derived from the Spanish spelling of the Quechua name kinwa) originated in the Andean region of Chile, Peru, Bolivia, Ecuador and Colombia, where it was domesticated 3,000 to 4,000 years ago for human consumption, though archaeological evidence shows a non-domesticated association with pastoral herding some 5,200 to 7,000 years ago. Quinoa was important to the diet of pre-Columbian Andean civilizations.Quinoa grain has been called a superfood, a term which is not in common use by dietitians and nutrition scientists. Protein content is very high for a cereal/pseudo-cereal (14% by mass), but not as high as most beans and legumes. 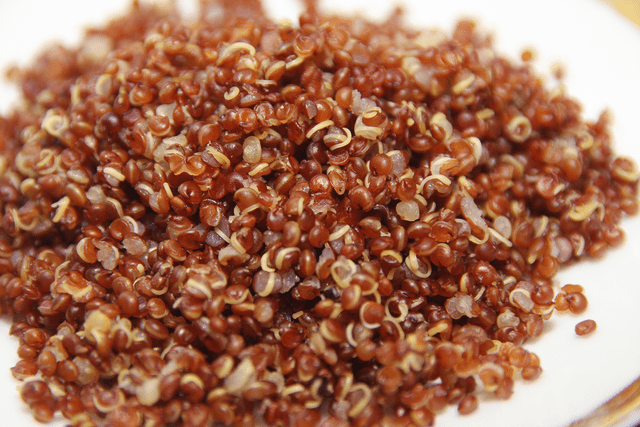 “Red quinoa” by blairingmedia – Own work. Licensed under CC BY-SA 3.0 via Wikimedia Commons.